Beloved in the Lord Right Reverend archpastors, reverend presbyters and deacons, God-loving monks and nuns, dear brothers and sisters! But why is this needed? It is needed so that, at least for a short while, we might tear ourselves away from our hectic everyday lives and spend several days in a spiritually enriching environment – so that, united in common prayer in church, in instructive discussions, and in brotherly interaction, we might feel and acknowledge ourselves to be sons and daughters of the great Russian Orthodox people. As history attests, a pure and unadulterated Orthodoxy has always been the primary and most fundamental treasure of the Russian people, for which they were willing to lay down their lives. Many of our clergy and faithful come from various non-Russian backgrounds, and have whole-heartedly embraced the sacred customs and traditions of the Russian Orthodox Church. Let us not fall into the temptation of segregating our Diocese into cultural groups, because as sons and daughters of the Russian Orthodox Church, we are all citizens of Holy Russia. When we speak of Holy Russia, we are not talking about the Russian Federation or any civil society on earth; rather, it is a way of life that has been passed down to us through the centuries by such great saints of the Russian Land as the Holy Great Prince Vladimir and Great Princess Olga, Venerable Sergius of Radonezh, Job of Pochaev, Seraphim of Sarov, and more recently, the countless New Martyrs and Confessors of the 20th century. These saints are our ancestors, and we must look to them for instruction on how to bravely confess the Faith, even when facing persecution. There is no achievement in simply calling oneself “Russian:” in order to be a genuine Russian, one must first become Orthodox and live a life in the Church, as did our forebears, the founders of Holy Russia! The Russian Church was the first to send missionaries to America, and today we must continue their salvific work, so that the Light of Christ may continue to shine ever brighter in this great American land. The only way that we can become worthy heirs of the Holy Hierarchs Tikhon and Innocent of Moscow, Venerable Herman of Alaska, the Holy Hierarch John of San Francisco, and other American saints, is to return to our roots and draw inspiration from the past. Living in the 21st century, we may think that progress only happens when we look forward, consigning the past to irrelevance. In the Orthodox Church, this is absolutely and unequivocally false! If we truly wish to spread the Orthodox Faith in America, we must look to our roots and drink of the pure fountain of Sacred Tradition that is Holy Russia. Today, America has need not just of Russia, but of “Holy Russia,” for it is only this Russia that represents true spiritual wealth; we have no need of a “renovationist,” modernized “Orthodoxy,” but of the true, Apostolic Orthodoxy, the Faith of the Fathers: the Orthodoxy lived by the Holy Church for almost two thousand years, and which that great cloud of witnesses, “All the Saints who Shone Forth in the Russian Land,” connects to the ancient Christian martyrs, monastics, hierarchs, and other God-pleasers. This pure, unadulterated, incorrupt Orthodoxy is dear to us as the one true and salvific Faith, which guides us to eternal life; and Russia is necessary to us and dear to our hearts as a firm bulwark of the true Faith on earth. 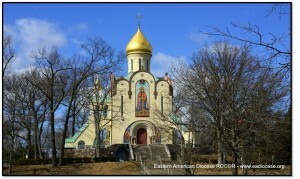 The annual St. Vladimir’s Day celebrations in Jackson are a time for our Diocese to come together and proclaim to America and the rest of the world that we are Orthodox Christians and that, indeed, “God is with us!” In the past, the faithful were united in their prayers for the salvation of Holy Russia, and monuments, such as St. Vladimir Memorial Church, bear witness to the testament and resolve of our ancestors. Now that communism has collapsed and Holy Russia is rising from the ashes, we must reanalyze the role of the Russian Church Abroad and the purpose of our traditional pilgrimages and celebrations. Today, when the Orthodox jurisdictions in America have restored canonical ties with one another, we must thank God for this newfound unity, while at the same time being mindful of the fact that many people are looking toward the Russian Church for an example of spirituality, piety, and unity. The purpose of this year’s St. Vladimir’s Day celebrations is to provide that example to America! We appeal to all of our clergy and faithful to make every effort to participate in the festive services at St. Vladimir Memorial Church on July 27-28. We are expecting the arrival of three miraculous icons of the Mother of God – the Kursk Root Icon, Protectress of the Russian Diaspora; the myrrh-streaming Hawaiian Iveron Icon; and the Pochaev Icon from Jordanville. The services will be bilingual, with the participation of five hierarchs and many clergy. His Eminence, Metropolitan Onouphry of Chernovtsy & Bukovina, will participate in the divine services as a representative of His Beatitude, Metropolitan Vladimir of Kiev, while His Eminence, Archbishop Justinian of Naro-Fominsk, will represent His Holiness, Patriarch Kyrill. Upon completion of the Divine Liturgy, a grand procession will be held around the church property, followed by the blessing of the waters and a new monument to Archbishop Vitaly (Maximenko), Archbishop Nikon (Rklitsky), and Metropolitan Laurus (Skurla). Several days prior to the celebration, on the feast of St. Olga (July 23-24), we will perform the Great Consecration of the lower church at St. Vladimir’s in honor of the Great Princess Olga. On Friday, July 26th, the celebrations will begin with St. Vladimir’s Ball, which will be held in the Rodina Russian House in Howell, NJ. 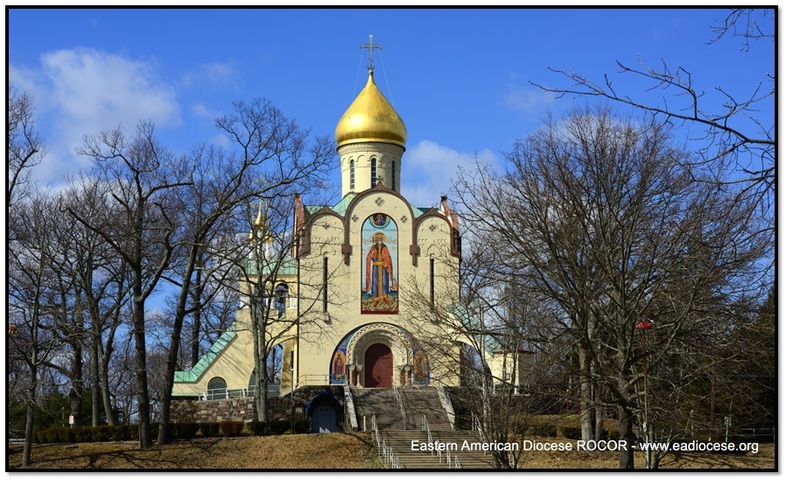 Years ago, parishes in the New York and New Jersey area would cancel services on St. Vladimir’s Day and meet in Jackson. Each parish would bring their choir, banners, and parish icon to use in the grand procession. We understand that it is difficult today for us to make this kind of commitment, but we nonetheless appeal to all of you in the hope that you will be able to attend. This feast is not just for the parishes in New York and New Jersey; rather, it is an all-diocesan celebration, and all of our clergy and faithful are invited to attend. Let us make haste to Jackson and mark the monumental 1025th anniversary of the Baptism of Rus and the 75th Anniversary of the Founding of our Memorial Church, in a manner worthy of the historic millennial path that has led our ancestors to the shores of this nation with a sincere desire to spread the Orthodox Faith! May our All-Merciful Lord, through the prayers of His saint, the Great Prince Vladimir, help fortify us in His salvific commandments!